While our company has marked 25 years in business, DFW Urethane’s principal owners, John Ewell and Benjamin Hurd, have spent even longer in the spray polyurethane foam industry, as have several of our spray technicians. This longevity represents invaluable experience – knowledge of the chemicals, equipment and processes associated with installing these roofing and insulation systems. We do it every day, and we’ve been doing it since 1980 – very few other SPF contractors can say the same. In keeping with this dedication to being on the cutting edge of the SPF industry, DFW Urethane’s key personnel recently attended the Sprayfoam 2017 Annual Convention and Expo, where not only were John, Ben, and their crew nominated as 2017 finalists for the Roof of the Year award (final 4) for their work on the historic William Lipscomb Elementary School in Dallas, TX (pictured here), but where John, Ben, and Chad participated in the SPFA (Spray Polyurethane Foam Alliance) Professional Certification Program (PCP) for Roofing. John passed a rigorous written examination and became an SPFA PCP Certified Project Manager in Roofing, and both Ben and Chad completed the complex field examination required to become SPFA PCP Certified Master Installers in Roofing. 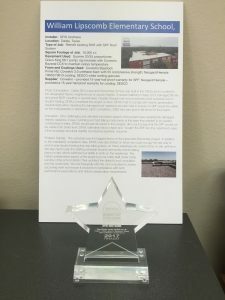 Given that many states are now considering adding SPFA PCP Certification as a requirement for all SPF roofers, DFW Urethane is proud to be ahead of the curve and prepared for the future of spray polyurethane foam roofing in Texas. Responsible for sales, estimating and customer relations, John recommends the most cost-effective, energy-efficient and appropriate roofing and insulation to address each customer’s specific needs. He has been in the industry since 1980, when he joined one of the largest spray polyurethane foam companies in the country at the time, VanWall. He left in 1986 to co-found DFW Urethane with partner Benjamin Hurd and offer the most advanced SPF roofing system on the market. John has completed numerous training workshops held by SPF product manufacturers as well as Spray Polyurethane Foam Alliance (SPFA) accreditation courses. During his three decades in the SPF industry, John has actively participated in the SPFA and was selected to serve on its technical committee, along with product manufacturers and technical experts. In this industry leadership role, representing SPF contractors everywhere, John provided input based on real-world installations and influenced how products are used in the marketplace. He has also helped write specifications used by cities and states for using polyurethane foam that reflect how these systems are actually installed. During the Sprayfoam 2017 Annual Convention and Expo, John completed the rigorous SPFA Professional Certification Program (PCP) in Roofing, becoming an SPFA PCP Certified Project Manager in Roofing. This program required that John had previously completed the SPF Assistant, SPF Roofing Installer, and SPF Master Installer PCPs, followed by a complex written examination, proof of completion of a project with at least 500,000 square feet of roofing, proof of a current OSHA 30-hour card, and several other requirements. Leading DFW Urethane’s operations, co-founder Benjamin (Ben) Hurd has been in the spray foam industry since the late 1970s. During his 30-plus years working with spray foam and elastomeric coatings, he has installed an estimated 15-18 million square feet of this high-tech insulated roofing system in virtually every type of environment. This has meant constantly keeping up with the latest industry developments as polyurethane foam products have evolved, and adapting to changes related to fire retardants, blowing agents and elastomeric coating systems. Early in his career, Ben’s sprayed roof projects took him from Texas A&M University and Southwest Texas State University to Oklahoma State University and Kansas City Power & Light in St. Mary’s, Kansas. In more recent years, he has installed high-tech polyurethane roof systems for companies including L-3 Communications, Texas Instruments, Anheuser Busch, Pepsi, and one of the largest search engines in the country. Ben has completed numerous hands-on training courses for SPF contractors provided by manufacturers and others in the industry, including BASF, Neogard, Bayer MaterialScience, NCFI, USCS, Carlisle, United Coatings, LaPolla and Thermo Materials. He has also taken multiple SPFA accreditation courses. During the Sprayfoam 2017 Annual Convention and Expo, Ben completed the rigorous SPFA Professional Certification Program (PCP) in Roofing, becoming an SPFA PCP Certified Master Installer in Roofing. This program required that Ben had previously completed the SPF Assistant and SPF Roofing Installer PCPs, followed by a demonstration, during an observed field exam, that he has extensive experience and competence spraying SPF in a variety of applications on a variety of roofs and roofing materials. Ben’s greatest satisfaction and rewards come from happy customers who are not only delighted with their roofs, but who become friends, welcoming him for a cup of coffee on a rainy day. A 30-year-plus SPF industry veteran, James has been working alongside DFW Urethane co-founder Ben Hurd since 1978. Not only is he one of the most respected spray foam applicators in the country, he possesses an unparalleled understanding of the highly sophisticated equipment required to apply it. James is also well-versed in all types of elastomeric coatings, including acrylics, single- and two-component urethanes, silicones, and epoxy. To advance his knowledge and ensure that he employs the best practices in applying spray polyurethane foam and coatings, James continually undergoes rigorous hands-on training offered by manufacturers and industry experts. He has completed training courses for contractors from BASF, Neogard, Bayer MaterialScience, NCFI, USCS, Carlisle, United Coatings, LaPolla and Thermo Materials, and multiple SPFA accreditation courses. James is a treasured member of the DFW Urethane team, a tremendous asset to our customers and an exemplary representative of the industry. Chad grew up in the spray polyurethane foam industry surrounded by the best. He has trained and worked for years alongside DFW Urethane VP/co-founder Ben Hurd and James Webb, two of the industry’s top technicians, and has learned the art and science of estimating from his father, company president John Ewell. In 2003, Chad participated in the very advanced equipment and troubleshooting course taught by renowned industry leader Jerry Whitaker at UCSC in Phoenix, Arizona. He also trained with Neogard, attended Honeywell’s weatherization school, and completed several SPFA accreditation courses. During the Sprayfoam 2017 Annual Convention and Expo, Chad completed the rigorous SPFA Professional Certification Program (PCP) in Roofing, becoming an SPFA PCP Certified Master Installer in Roofing. This program required that Chad had previously completed the SPF Assistant and SPF Roofing Installer PCPs, followed by a demonstration, during an observed field exam, that he has extensive experience and competence spraying SPF in a variety of applications on a variety of roofs and roofing materials. His lifelong exposure to the talent and knowledge on the DFW Urethane team cannot be bought, and he absorbs every bit of his training like a sponge, all to the benefit of DFW Urethane customers. 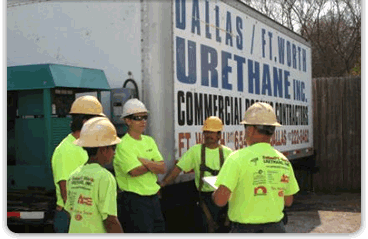 Jacinto has been with DFW Urethane since 1999. Originally hired to help keep shop equipment running, he soon became an invaluable member of the team with his expert welding skills. Over time, after working day in and day out with Ben Hurd and James Webb, Jacinto trained to become a spray technician and is now one of the best in the business. In true family style, Jacinto’s son, Vielman, is now working for DFW Urethane and currently training as a spray technician as well. Jacinto and Vielman are both making a positive difference for our customers as members of the team. Brandon is the newest member of the DFW Urethane team. He has been apprenticing alongside Ben, James and Chad for several years. Assigned to Chad’s crew, Brandon is eagerly learning all the intricacies of spray foam equipment and keeping it in top operating condition. He is already a rising star and has a bright future solving our customers’ roofing challenges.